A Child Account can only be created after the Parent Account is set up, which we just completed. 1 Open Order Manager now if it is not already open from the previous exercise. 2 Click the Add New button located under the Process button. 3 The Trade Level (account balance) cell is selected automatically. Type: “5000000” ($5M), and press the Tab key. 4 In the Account cell type: “Child_demo” ... and press the Tab key. 5 In the Account ID cell type: “#8913_c”. 6 Click the drop-down list box of the Type cell, and select Child (shown upper right). 7 Ignore the Change Status field for the moment, and click the drop-down list box of the Parent ID cell, and select “#8913_p” (shown right). • This is an important step: You have just associated the Child with its “theoretically perfect” Parent Account. 8 Using the scroll bar at the bottom of the OM screen, scroll right until you see the Round Size heading. Click the associate drop-down list box, and select Single unit. This tells OM to round to the nearest contract or share. None rounds down (like the NEWCONTRACTS keyword), and Hundreds unit rounds to the nearest hundred. 9 Click on any cell in the Parent Account, and the entire row will be selected. 10 Check the Calendar, and make certain that Sept. 13 is designated as the Last Market Day (as shown, right). 11 Now, Click the Run Sizing Rules button located at the bottom of the Order Manger screen. • Click OK when the following dialog appears (right). 12 Click the Detail button associated with the Child Account. It is shown below, superimposed on Default Positions for the Parent. The system (our example System 1), is theoretically holding CD Short, for a trade entered on 20010904 at a price of 0.6408. Note that the position Size in the Parent is 11,240 contracts and that the parent carries P/L figures from trade inception. The Child on the other hand, since it has not begun trading yet, carries zeros in those respective fields. When you clicked Run Sizing Rules to complete the Child account setup, the Child was scaled to the theoretically perfect Parent, and after the close of the 13th ready to begin trading on the 14th it shows 112 contracts CD. Remember – we are looking at the world through the eyes of a trader starting a new program on the morning of Sep-14-2001, and the CD position above is theoretically held after the close of trading on Sep-13-2001, when the Parent and Child account setup was completed. When you begin trading a new account, you will need to convey to your broker what your existing theoretical positions are, so that they can be entered (typically on the open of the initial trading day). In the example above, you would need to report the Child’s position of 112 contracts of CD to your broker that morning (Sep-14-2001). This process allows a seamless transition from the theoretical world, into live trading. Though we recommend never changing the size of the Parent’s Trade level once the account is established, you will want to update the Trade Level of the Child Account daily, to reflect the balance in the actual account that the Child represents. Since the system is currently holding short CD, the only order that appears for this position is the associated Short Exit (SX). The trades on your screen may present in a different order than the ones shown in this tutorial. The system is flat AD and JY, and for each, long and short prospective entries (LE, SE), and their associated contingent exit orders (LX, SX), are shown. If you’re following along in Mechanica, examine the corresponding screen for the Parent account, and you will see that the position Size(s) for all orders have been scaled to the Parent, and Rounded to the nearest Single Unit, as we instructed OM to do during the setup of the Child account. 14 Click on the Parent account, and move the Calendar forward one trading day, to Sep-14-2001. The Calendar is associated with Parent accounts. If a Child account is highlighted, and you move the Calendar date, then when you click on the Parent account, the Calendar may jump forward, or back in time, and will correctly display the color-coded Processed, Last, and Next market days. 15 Click the Process button to the left of the Parent account. • Sep-14-2001 is the first trading day of this program, and the Parent account Trade Level has fluctuated to reflect today’s account activity (right). • Click on Detail for the Parent account, and you will see the CD trade theoretically held short as of the inception of trading this account is shown as having been entered on 20010904, and currently reflects a profit. Yet the Child account below shows a different entry day, and a loss. How can that be? The Parent continues to show the historical, theoretical entry date of the position, as it should, while the Child account is updated to reflect the entry of that same position at the open, on the morning of 20010914, at the inception of trading this Child account. The P/L is as of the close of 20010914. • Note also that the entry stop for JY was hit today, and we’re currently long 36 contracts, at 0.8659. • Click on the Default Orders tab for the Child account, and you will see the associated long and short exits for the open CD and JY positions, along with prospective entries (LE, SE), and associated contingent exit orders for AD. 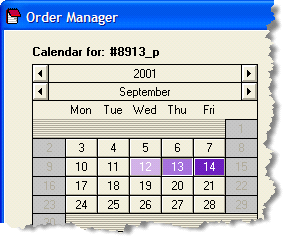 16 Click on the Parent account, and move the Calendar forward one trading day, to Sep-17-2001 (Monday). 17 Click the Process button to the left of the Parent account. 18 When processing is through, click on Detail of the Child account. • Note that the stop for AD was hit today, and the system is currently short 47 contracts of AD at 0.4936 (graphic not shown). The system now has open positions in all three (3) instruments in the portfolio.